Flexi loop plastic carrier bags have reinforced handles made from thick polythene, which are welded to the inside of the bag. The Flexi loop handles allow full bag usage whilst also being comfortable to hold. 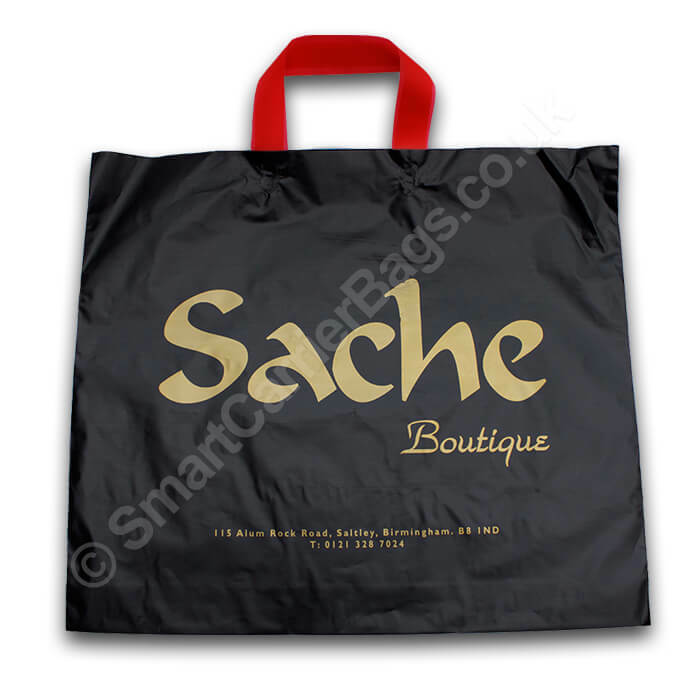 These bags can have a bottom gusset OR both side and bottom gussets, which can be printed on. Cardboard support for the bottom gusset is also available; providing extra sturdiness. The polythene folded in from the top (turn over top) and welded across provides additional strength to the handle area. 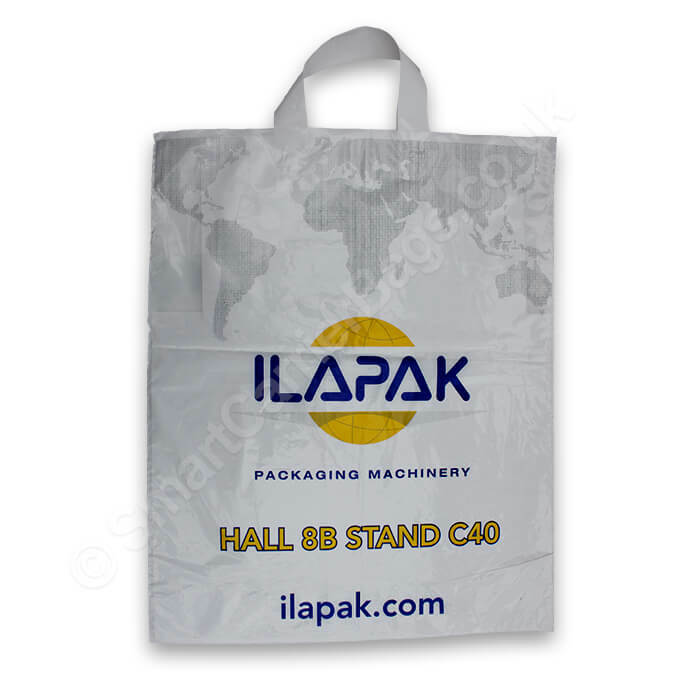 The price for flexi loop polythene bags will vary depending upon the size, thickness, colours, and printing requirements. Here's what you get with Smart Carrier Bags..
Flexi loop plastic carrier bags have become popular and used in most of UK’s supermarkets and they are often branded as ‘Bags for Life’. 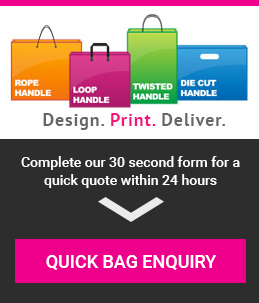 Our printed flexi loop handle carrier bags are competitively priced, but durable and long lasting; they’re designed and printed with customer’s logo to make an impact. Our flexi loop handle bags are available in a range of stock colours which allows you to choose a colour of your choice. The look of a bag is equally as important as the quality. Our bag’s reusable qualities make it “bag for life”. Flexi loop handle plastic carrier bags can be made from a range of material thicknesses and a choice of low density, high density or medium density polyethylene depending on your needs. Most of our loop handle bags are made from biodegradable materials. 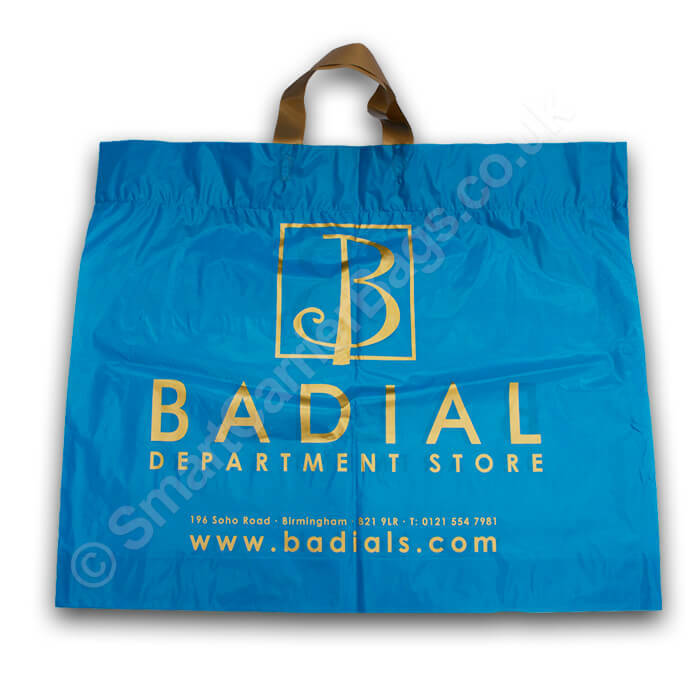 We also print an environmentally friendly logo free of charge, which allows your customers to know that you’re using bags that are produced from biodegradable materials. These carrier bags can be made from either a flat thickness film with or without turn over top or from a varigauge film which is normally double in thickness from the top than at the bottom of the bag to give extra strength where the handles are welded. With a flat thickness film turn over top and welded across provides additional strength to the area where the handles are welded. 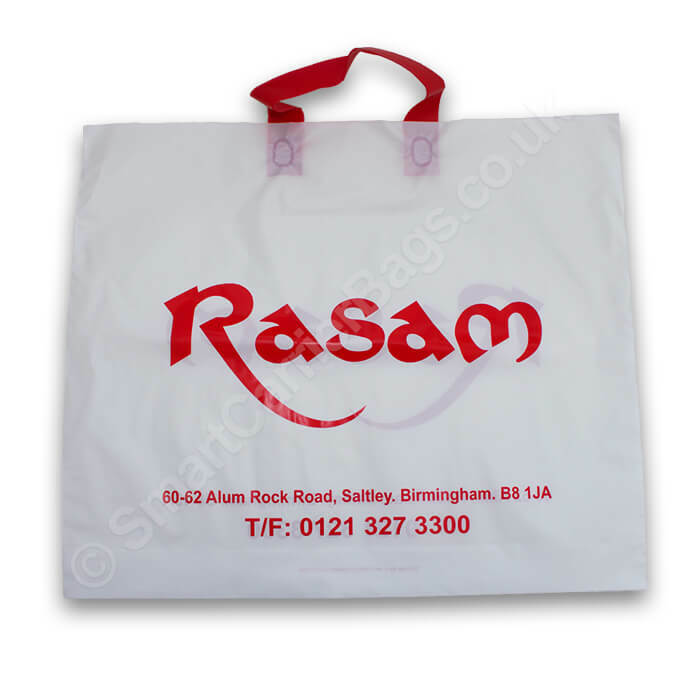 These bags can have a bottom gusset or both side and bottom gussets, which can be printed on. Cardboard support for the bottom gusset is also available, providing extra sturdiness. 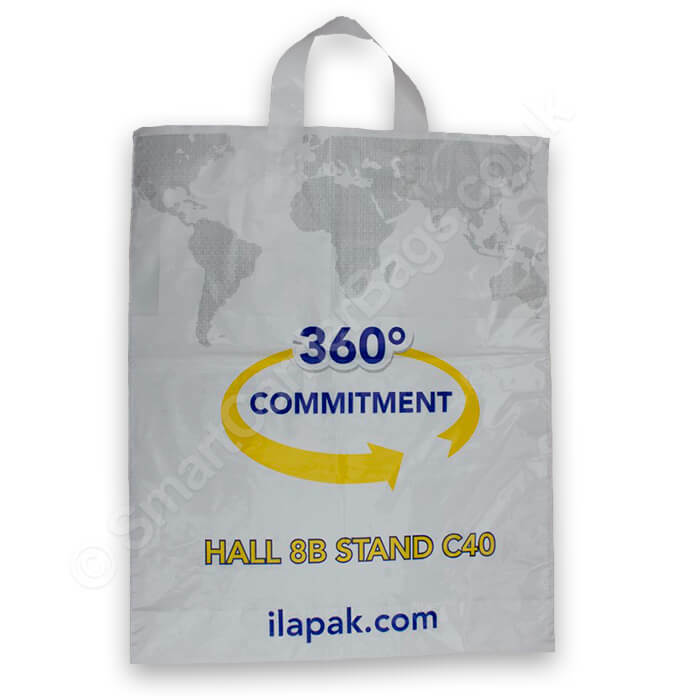 Polythene flexi loop carrier bags are both strong and attractive making them an excellent bag for your brand promotion. 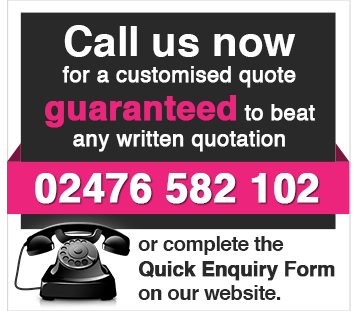 We can print from one spot colour for multi-colour logos with company details. 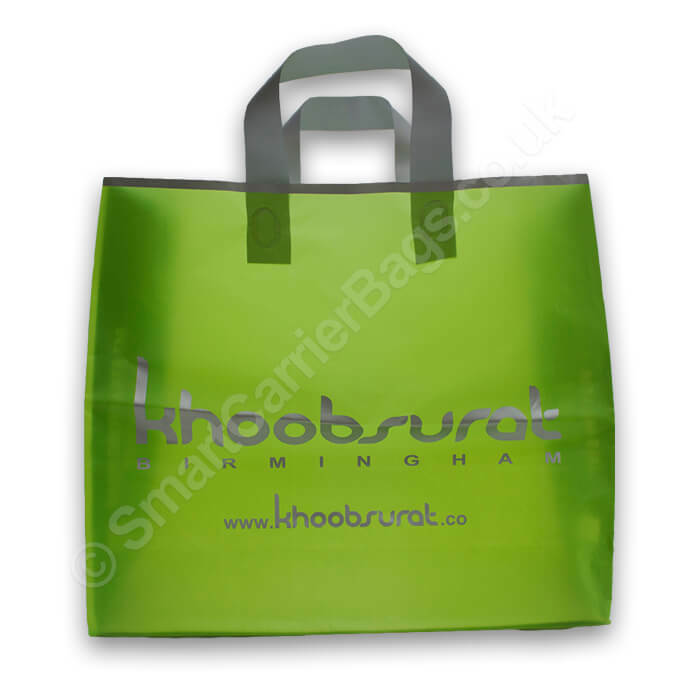 We can print your bags with 100% ink coverage which allows you to have base colour of bag of your choice. 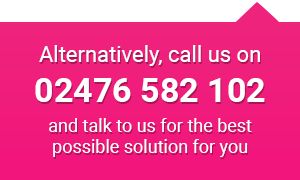 There is choice of film thicknesses to choose from depending upon your requirements. 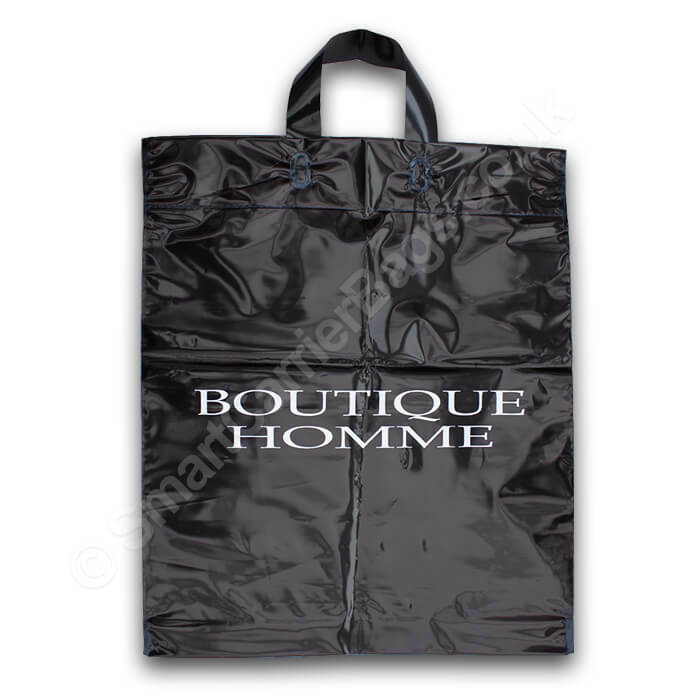 Our minimum quantity for these bags is 1000pcs and delivery lead time 2-3 weeks. 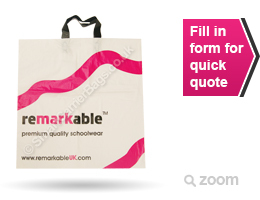 Quantities over 5000 bags can be offered at much more competitive prices with a delivery lead time of 12-14 weeks.